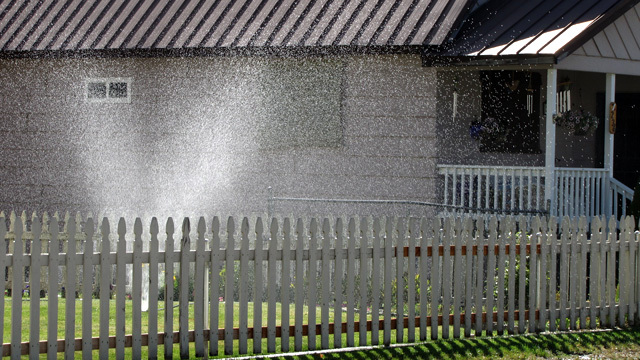 California water officials, confronting the possibility that the state's drought will continue into a fourth year, are proposing a strict set of new regulations that would bar residential water users from hosing down sidewalks and overwatering their lawns. Violation of the new rules could carry penalties of $500 per violation. The regulations were unveiled Wednesday in Sacramento by Felicia Marcus, chair of the State Water Resources Control Board. She said the severity of the current drought, now in its third year, makes it imperative to crack down on wasteful water use. except where the water is part of a recirculating system. The water board's proposal gives local water agencies — for instance, the Santa Clara Valley Water District, the East Bay Municipal Utility District and the San Francisco Public Utilities Commission — leeway to impose and enforce their own water-conservation rules. Urbandistricts would get 30 days to impose outdoor irrigation restrictions, either limiting outside watering to two days a week or taking "comparable measures." The districts would also be required to file monthly reports on per capita water use among customers. Steven Ritchie, assistant general manager of the SFPUC's water operation, told KQED's Mina Kim that the state's proposed restrictions "are good things to do" given the severity of the drought and that they're similar to measures the agency has already considered. He said his agency will weigh how to enforce the new rules and could adopt a system in which customers get warnings for first violations. "That would be consistent with a lot of other things, even regular police and speeding," Ritchie said. "Lots of times warnings are given instead of actual penalties. I think we'll want to be sure the punishment fits the crime." Marcus said the state is acting now because the voluntary cuts that Gov. Jerry Brown and local water districts have called for have fallen far short of their goals. Brown called for a 20 percent reduction target earlier this year. But a water board report last month said that actual water savings over the previous three years have ranged from 10 percent in the Sacramento region to 2 percent in the Bay Area to 0 percent on the Central Coast. The San Francisco water system has set a 10 percent voluntary conservation target for the 2.5 million people it serves, which include residents of the city, most of the Peninsula and parts of southern Alameda County. The SFPUC's Ritchie says customers are starting to conserve more. He said systemwide water use last week was 234 million gallons, down from 272 million gallons a year ago — a 16 percent reduction. "I think people are starting to get the message," Ritchie said. KQED's Mina Kim spoke to Paul Rogers, managing editor of KQED Science, about the emergency regulations. Wasting water outdoors amid the state's drought will begin hitting Californians in the wallet under get-tough restrictions being proposed by state regulators, with fines of up to $500 a day for overwatering front lawns or washing a car without a shut-off nozzle on the hose. The State Water Resources Control Board next week is scheduled to consider draft emergency regulations made public Tuesday. The rules are intended to put teeth into conservation efforts that so far have produced disappointing results. Most of the regulations are aimed at reducing outdoor water use in cities and towns, which the board said accounts in some areas for more than half of residents' daily water use. The regulations would prohibit overwatering of lawns and landscaping that causes runoff onto sidewalks or streets, washing sidewalks, driveways and other hard surfaces, using a hose to wash a vehicle unless the hose has a shut-off nozzle and using drinking water in a fountain or decorative water feature unless the water is recirculated. Violations would be infractions punishable by fines of up to $500 a day, and tickets could be written by any public employee empowered to enforce laws. While $500 is the daily maximum, most cities are likely to have a sliding scale that starts with a warning and builds for repeat violations. "We are in a drought of historic proportions," board Chairwoman Felicia Marcus said. "Many urban water users don't realize how bad this drought is. They're not seeing the communities that are actually running out of water. ... They don't see the streams and creeks running dry." If the board adopts the regulations after hearing comments during a July 15 public meeting in Sacramento, the rules would take effect immediately and remain in effect for nine months. They do not target indoor water use, such as doing the laundry or dishes, although some individual cities and water districts have asked or required their users to reduce overall water consumption. Marcus said the restrictions to be considered next week represent what the water board considers the minimal level of conservation. "We're not doing standards here that say you have to kill your lawn," Marcus said. "It doesn't mean you can't take a shower. ... It just means, think about it." She said the board might consider additional steps as the drought continues. Under the proposed rules, urban water agencies would have to implement their water-shortage contingency plans to require mandatory restrictions on outdoor water use, if they have not done so already. Water agencies without such a plan would have to act within 30 days to require their residents to restrict outdoor irrigation to no more than two days each week or take other mandatory steps to conserve the same amount of water. Water agencies that do not comply could face fines up to $10,000 each day. The generally obscure State Water Resources Control Board is assuming a more high-profile role during California's drought, which has left some communities scrambling for drinking water and led to thousands of farm acres being fallowed. The board usually regulates such things as wastewater and irrigation discharges to rivers and the ocean, as well as any activity that changes a waterway or harms water quality. But the board's five members, who are appointed by the governor, are acting under Gov. Jerry Brown's emergency drought proclamation in January and a related executive order in April, as well as drought legislation he signed in March. Last week, for example, the board adopted a different set of emergency regulations that will accelerate enforcement of orders prohibiting some junior water rights holders from diverting water from rivers and streams. The additional restrictions the board will consider next week were proposed after a recent survey of water suppliers serving 25 million Californians showed that current voluntary and mandatory conservation efforts had resulted in just a 5 percent decline in use through May. Brown is seeking a 20 percent reduction. The survey found 30 percent of water suppliers had imposed mandatory restrictions that include limits on outdoor irrigation, washing vehicles and filling ornamental fountains and swimming pools. Water use already was down the last three years because of dry conditions and poor economic conditions, and the survey found a significant reduction this May compared with the previous three years. Nearly all those who responded said they had increased their conservation outreach, while 40 percent had increased their enforcement and monitoring. Two-thirds of the suppliers are requesting 20 percent water conservation, and 7 percent changed their water rates in response to the drought.